Later you can synchronize your Booknizer library with your e-reader device (Kindle, Nook, or others). However, it is also possible to read e-books on the computer. Even if reading a complete book off your computer monitor may be inconvenient, you may still want to open e-books from Booknizer to check what's within. 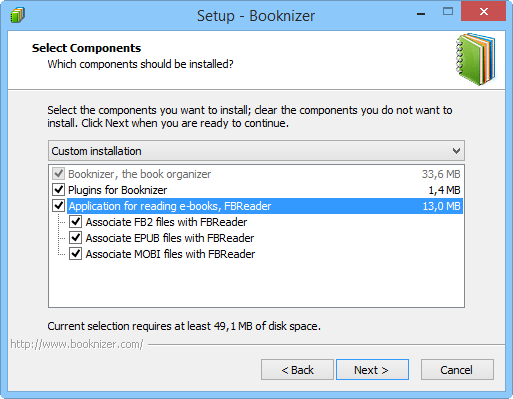 So, when installing Booknizer, just choose to install FBReader and associate it with e-book formats. 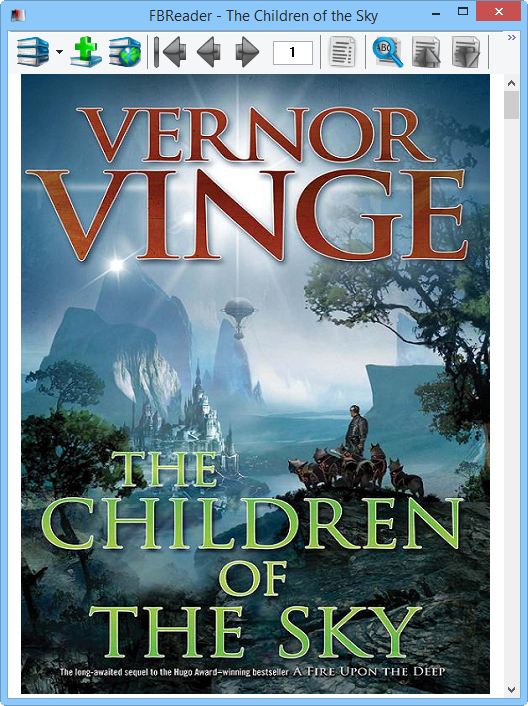 Click on the icon to open the e-book in the associated reader program. Booknizer uses the program that is registered in Windows for the given file type. So, for example, if PDF files are associated with Adobe Reader in your system, Booknizer will open your PDF book in Adobe reader. The same is true for other file types. As you could see on the first screenshot in this article, FBReader associates itself with EPUB, MOBI and FB2. So, if you open a book in one of these formats, FBReader will be displayed. Use "Page up" - "Page down" keys to turn pages. 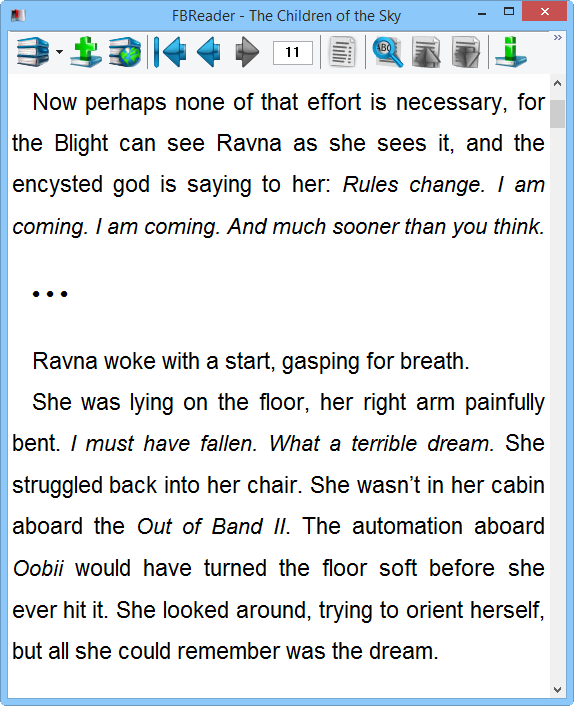 After you close FBReader, it remembers your position in the book, so next time you re-open the book, it will display the last page you read. If you added books using other methods (by title, by barcode, etc. 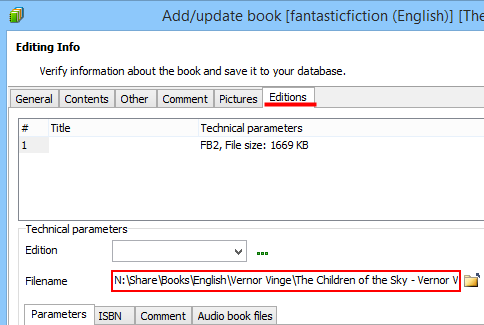 ), you can associate such books with e-book files in the "Edit info" window. Double-click on the page of the book and open the "Editions" tab. Enter the path to the e-book file into the "Filename" field, or click on the folder icon next to the field and select your e-book file using the "Open file" dialog. After this, click "Save" to save the link. If you have a different e-reader program associated with a particular file type, it will be used instead of FBReader.